Wally Pfister is best known as the cinematographer who helped director Christopher Nolan make a host of great movies, including “Inception,” “Insomnia” and the most recent Batman trilogy. With “Transcendence,” he shifted his responsibility from imagery to the entire product, taking the role of director. The result is mixed. The themes in “Transcendence” are every bit as complicated and engaging as those in Nolan’s movies. Unfortunately, the execution is less convincing. The focus is on Will and Evelyn Caster (Johnny Depp and Rebecca Hall), a power couple working on the most advanced artificial intelligence system in the world. Despite their ties to technology, Will and Evelyn are down to Earth. In fact, Will takes great pains to erect a technology-free zone in his lovely outdoor garden. Things change when he is diagnosed with a terminal illness and Rebecca – unwilling to let go – convinces him to upload his consciousness into their most-advanced artificial intelligence system. Suddenly, the world is left pondering the dangerous implications that accompany Will’s powerful new form. Pfister gets points for his setup, which allows viewers to easily slide into the intricacies of the issue. He also does a fine job allowing his cast to work. 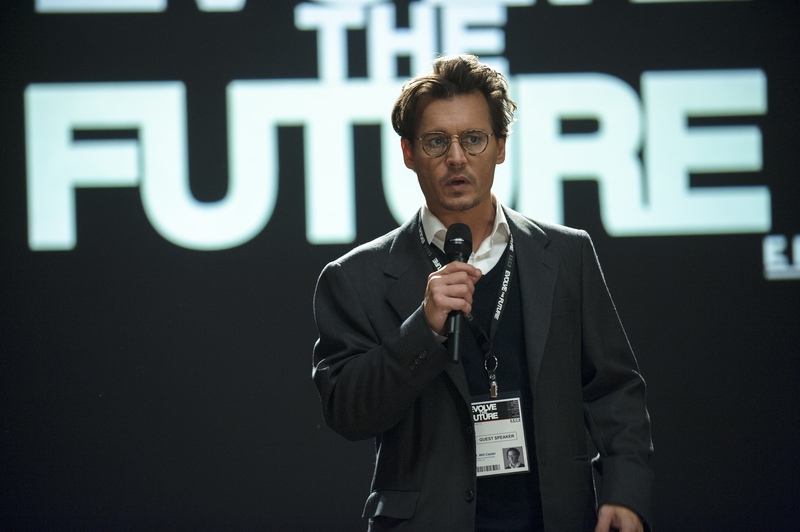 Depp and Hall are convincing as sharp scientific minds, and they get apt support from Paul Bettany and Morgan Freeman, who play fellow scientists. Unfortunately, the project isn’t as deep as it should be. The possibility of artificial intelligence opens countless questions, but “Transcendence” barely scratches the surface. As with movies like “The Terminator” and “The Matrix,” the focus is primarily on the worrisome aspects of AI, and the plot moves so quickly that the action seems forced. Even with its flaws, “Transcendence” is worth seeing because of the ideas it forces one to consider. Artificial-intelligence research is developing so rapidly that important scientists have issued warnings about the technology. “Transcendence,” even with its deficiencies, deserves credit for spotlighting this issue. Ayer, who also wrote the much-hyped “Training Day,” likes to explore the dark side of life, and “Sabotage” is brutal from the first frame. The movie starts with DEA agent John “Breacher” Wharton (Schwarzenegger) watching a video of his wife being tortured by members of a drug cartel. In the next sequence, Breacher and his team of elite drug cops raid a cartel compound, stashing $10 million in drug money with the intent of stealing it. Later, the team discovers that the cash has gone missing, and an unknown force is out to kill them one at a time. Breacher and his team then attempt to unravel the mystery while local detectives Caroline Brentwood (Olivia Williams) and Darius Jackson (Harold Perrineau) follow their every move. “Sabotage” is bloodier and more profane than the Schwarzenegger norm, and his character, Breacher, is more somber. Ayer’s films aren’t necessarily more realistic than those that Schwarzenegger typically inhabits, but the director has a distinctive point of view that emphasizes the bleak side of humanity. Sometimes, as in “End of Watch,” that perspective results in a powerful dissection of societal problems. Other times, as in “Sabotage,” it feels over the top. Still, there is a lot to enjoy in the film. “Sabotage” has a strong supporting cast, including Sam Worthington, Terrence Howard and Mireille Enos, and all players do a respectable job. Schwarzenegger has never been a great actor, and that hasn’t changed. What he lacks in talent, he generally makes up for in charisma, and his reading of Breacher is just good enough to keep the simplistic plot chugging. The movie has some plot holes, and the final act isn’t as good as one might hope. Even so, “Sabotage” is a respectable thriller that sets itself apart with Ayer’s ability to insert viewers into a criminal underworld that most have only read about. Blu-ray and DVD extras include a making-of feature, an alternate ending and deleted scenes. It’s rare for an obviously Christian film to receive a wide release in America, so movies like “Heaven is for Real” attract considerable attention … even when they aren’t very good. Unlike most Christian movies, “Heaven” boasts well-known stars (Greg Kinnear and Thomas Haden Church) and a famous co-writer and director (Randall Wallace). The latter helmed “We Were Soldiers” and “Secretariat” and received an Oscar nomination for writing “Braveheart.” With all this talent, one might expect “Heaven” to be better than the average Christian movie, but – with the exception of production value – it’s not. Based on the best-selling book by Todd Burpo, the film is set in 2003, and it tells the story of his son, Colton Burpo (Connor Corum), a then-3-year-old who claims to have visited heaven while undergoing emergency surgery. Curiously, the boy’s claims were criticized by some Christians who believe his statements contradict Biblical teachings. Despite the controversy, the book sold more than a million copies, paving the way for Wallace’s workmanlike adaptation. The primary problem with “Heaven is for Real” is not the premise. Clearly, believers will warm to the material more readily than skeptics, but one needn’t subscribe to a particular faith in order to properly analyze the picture. On one hand, the movie is the story of a young boy who returns home from a dangerous surgery describing a series of inexplicable events. For instance, he claims to have left his body and watched as his mother (Kelly Reilly) and father (Kinnear) were praying for him in separate rooms. On the other hand, the film comes off as a minor indictment of skeptics. One could even see it as a lashing out at everyone who criticized Colton’s story. In the film, Todd Burpo celebrates his son’s claims, causing church officials to question his fitness as a pastor. Since Colton’s illness occurs early, this accounts for much of the conflict in the film. Ultimately, this simplicity represents the movie’s key flaw. Although Colton’s claims are remarkable, the movie spends most of its time focused on the gap between those who believe and those who don’t, and this grows tiresome … especially since viewers will likely be predisposed to one side or the other. Blu-ray and DVD extras include a behind-the-scenes featurette and deleted scenes. Writer-director-actor Tyler Perry’s following is so strong that his name is now an integral part of every movie he releases. This phenomenon may illustrate a thirst for films that push values like loyalty, honesty and thankfulness. Otherwise, it is difficult to understand his immense popularity. Although Perry’s movies always have their hearts in the right places, they are – like “The Single Moms Club” – largely simplistic and dull. In “Moms,” Perry focuses on a group of women who, for various reasons, are raising children alone. One of the moms is Jan (Wendi McLendon-Covey), a driven publishing executive who used a sperm donor to become pregnant. Jan’s best friend is Hillary (Amy Smart), a pretty socialite left reeling by a bad divorce. They are joined by May (Nia Long), who is raising a son without the help of his drug addicted father; Esperanza (Zulay Henao), a beauty whose ex-husband controls her life; and Lytia (Cocoa Brown), an inner-city woman trying to keep her young children from landing in jail. These five come together when their children act out at an exclusive prep school and the principal demands that they make amends by planning an upcoming dance. As the women get to know each other, their conversations shift from business to their personal lives, and they discover that they have great deal in common. So, they form a support group designed to relieve the pressure they each feel. Because this is a Tyler Perry movie, there is conflict and there are lessons to be learned. The problem is, the lessons are obvious and the conflict is never particularly dramatic. The movie also contains performances that range from realistic to over-the-top. McLendon-Covey, for instance, makes Jan so uptight and mean-spirited that she seems like a caricature. Long, on the other hand, offers an earthy and believable reading of May. Supporting characters pop up on different points of the spectrum, giving “Single Moms Club” a serious problem with tone. Perry, who appears in a supporting role, guides the project at a steady pace, but the material isn’t deep enough or interesting enough to merit its 111-minute run. Anyone who has watched a Lifetime TV movie will know where the project is headed before it takes off, and that’s a problem no matter whose name is on the title. Blu-ray and DVD extras include two behind-the-scenes features. “Cesar Chavez”: Michael Peña plays the title character in this biopic about Hispanic activist Cesar Chavez. America Ferrera, Rosario Dawson and John Malkovich also star. Directed by Diego Luna. “The Angriest Man in Brooklyn”: This dramedy features Robin Williams as an eternally angry man who is wrongly told that he has 90 minutes to live. Shocked, he uses that time to reconcile with everyone in his life. Mila Kunis, Peter Dinklage and Melissa Leo also star. Directed by Phil Alden Robinson (“The Sum of All Fears”). “Wahlburgers” – The Complete First Season: First nine episodes of the A&E reality series centered on the Wahlburgers restaurant owned by chef Paul Wahlberg and his movie star brothers, Donnie and Mark Wahlberg. “The Essential Jacques Demy”: Fans of French director Jacques Demy will do well to check out this beautiful, six-movie set from the Criterion Collection. The films span genres and decades, giving the viewer a nice cross section of Demy’s work. Included are: “Lola” (1961), “Bay of Angels” (1963), “The Umbrellas of Cherbourg” (1964), “The Young Girls of Rochefort” (1967), “Donkey Skin” (1970) and “Une Chambre en Ville” (1982). “James Clavell’s Shogun”: Blu-ray debut of the award-winning, 1980 miniseries about an English sailor who becomes immersed in the culture of 17th century Japan. The nine-hour program was adapted from the novel by James Clavell. Richard Chamberlain, Toshiro Mifune, Yoko Shimada, Damien Thomas and John Rhys-Davies star. “Insomnia”: Director Erik Skjoldbjærg’s 1997 movie about a Swedish detective (Stellan Skarsgård) who battles personal demons while investigating a murder inspired Christopher Nolan to make an English-language version in 2002. This Criterion Collection release offers a 4K restoration of Skjoldbjærg’s original. “Antboy”: Story of a 12-year-old who becomes a superhero after he is bitten by an ant and develops super powers. Oscar Dietz, Samuel Ting Graf and Amalie Kruse Jensen star. Directed by Ask Hasselbalch. “GMO OMG”: Documentary focused on the widespread use of genetically modified organisms in our modern food supply. Directed by Jeremy Seifert. “American Girl – Isabelle Dances Into the Spotlight”: This latest entry to the “American Girl” movie franchise focuses on Isabelle, a 9-year-old dancer struggling to gain self confidence. “Ginger Snaps”: Blu-ray release of director John Fawcett’s 2000 horror film about suburban sisters whose lives are thrown into turmoil when one is bitten by a werewolf.